With only a small swath of northern Indiana bordering Lake Michigan, it’s natural that flooding isn’t as great of a concern here as in low-lying areas of states bordering the Gulf of Mexico.But our Munster injury lawyers know it’s unwise to ignore the potential risks, particularly when we see a combination of widespread rainfall, melting snow and saturated soil – all of which contributes to flooding, particularly in lowland regions of the state. In fact, the Indiana Department of Transportation recently issued a warning urging motorists who encounter a flooded roadway to immediately turn around. It’s not worth the risk of vehicle damage, injury and even death that can occur when drivers try to take a chance in high water. While state traffic crews have been working around the clock to barricade highways that have seen flooding and remove excess debris from drainage sites, the fact is, flood waters can rise quickly and with little warning. Sport utility vehicle drivers in particular may be at risk because drivers may have a false sense of security upon encountering flooding. Unless your vehicle doubles as a boat, be warned that six inches of standing water is sufficient to cause passenger cars to stall out. A foot of water is enough to cause you to float away. The National Weather Service reports that the vast majority of flash flooding deaths occur when people encounter the flood waters in motor vehicles. It’s especially risky when the water is moving rapidly. Bear in mind that if there are barriers blocking the roadway with warning signs of flooding, you would be taking an enormous risk with your life and those of your passengers by driving around them. Note too that if you choose to travel flooded roadways and get stranded, emergency crews may not risk their own lives to save you. It’s possible you may not even be able to call for help, particularly if flooding results in downed communication lines. And even if help is on the way, it may take much longer than it normally would, due to the impeding water. And if you get stuck and think you can simply wade through, consider that exposure to standing flood water has been documented by the Centers for Disease Control to be associated with a high risk of infectious diseases, chemical hazards and injuries. You should also be cautious of roadways in the immediate wake of a flood. The fact is, flooding can cause damage to both roads and bridges. And just because the damage isn’t visible doesn’t necessarily mean it’s safe to proceed. 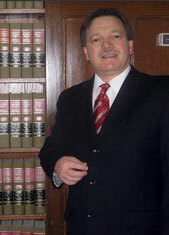 Contact Indiana Personal Injury Attorney Burton A. Padove at (219) 836-2200.